Treat yourself like Royalty and book your Palace Resort vacation with us! Palace Resorts have 7 amazing properties located throughout Mexico. 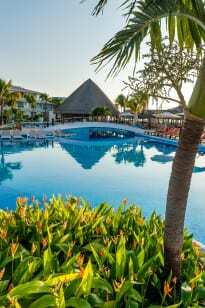 They have three adult only resorts located in Cancun and Isla Mujeres. There are four family friendly properties located in Cancun, the Riviera Maya, and Cozumel. Each resort will have prime, beachfront locations. Palace Resorts offer luxurious accommodations, including: a double Jacuzzi, mini-bar, 24 hour room service, top shelf premium alcohol, wireless internet, and unlimited long distance phone calls. To top it off, you can receive up to $1500 in resort credit that can be used on spa, golf, room upgrades, candle lit diners, select excursions, and more. Contact Us about Your Palace Resorts vacation! Considering a trip to Mexico? Book an all-inclusive vacation to one of the Palace Resorts with Enchanted Honeymoons. You’ll enjoy the experience of planning your trip and your final destination! You’ll say, “Gracias” to us and “Hola” to the beaches of Mexico with Palace Resorts! Call us today (402) 281-3022 or contact us for more information about your Palace Resorts all-inclusive vacation!